You’ll want to skip dinner and go straight to dessert when you bring this delicious Berry Pinwheel Cake to your Easter gathering. This decadent cake is filled with delicious strawberry flavor that will entice your taste buds. Though this may be a traditional Easter treat you will definitely be making this treat for your get-togethers all year round. Preheat oven to 375°. Line bottom of a greased 15x10x1-in. pan with parchment paper; grease paper. Beat egg yolks and eggs on high speed 3 minutes. Gradually add sugar, beating until thick and lemon-colored. Beat in water, oil and vanilla. In another bowl, whisk together flour, baking powder and salt; fold into egg mixture. Spread evenly into prepared pan. Bake until top springs back when lightly touched, 10-12 minutes. Cool 5 minutes. Invert onto a tea towel dusted with confectioners’ sugar. Gently peel off paper. Roll up cake in the towel jelly-roll style, starting with a short side. Cool completely on a wire rack. For filling, beat cream until it begins to thicken. Add sugar; beat until stiff peaks form. Fold in lemon curd. Gently fold in strawberries. 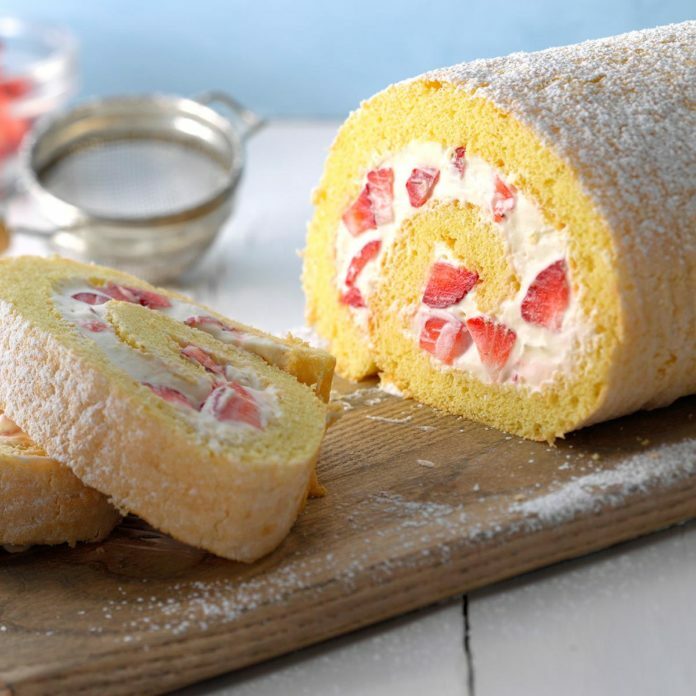 Unroll cake; spread filling to within 1/2 in. of edges. Roll up again, without towel; trim ends. Place on a platter, seam side down. Refrigerate, covered, 1 hour. Dust with confectioners’ sugar before serving. Make sure to let us know if you enjoyed this decadent Berry Pinwheel Cake! Check back on www.bctent.com/blog every Monday for a #MenuMonday party food or beverage recipe!